We have investigated the ultra-fast carrier dynamics in Molecular Beam Epitaxy (MBE)-grown InAs/InGaAs/GaAs quantum dots (QDs) emitting at 1.3 μm by time resolved photoluminescence (TRPL) upconversion measurements with a time resolution of about 200 fs. Changing the detection energies in the spectral region from the energy of the quantum dots excitonic transition up to the barrier layer absorption edge, we have found that, under high excitation intensity, the intrinsic electronic states are populated mainly by carriers directly captured from the barrier. Self-assembled semiconductor quantum dots (QDs) are currently deeply investigated because of their fundamental optical properties and their potential implementation as the active region of high-performance semiconductor lasers [1–3] and high-efficiency infrared detectors [4, 5]. Details of carrier relaxation processes in these nanostructures are of great interest due to their immediate implications on the photoluminescence (PL) efficiency [6, 7], strongly influencing the performances of the optoelectronic devices. Laser device emitting at 1.3 μm, as required for the second window telecommunication devices, has already been achieved by means of InAs QDs capped with an InGaAs quantum well (QW) in a GaAs barrier, providing low-threshold, high modal gain and high characteristic temperature. In this work we have investigated the carrier dynamics in MBE-grown InAs/InGaAs/GaAs QDs emitting at 1.3 μm at room temperature. The rise time of the ground state is just the same of the first excited state, indicating that the carriers can cool-down from the barrier filling nearly simultaneously to the QD lower energy states through a continuum background relaxation. 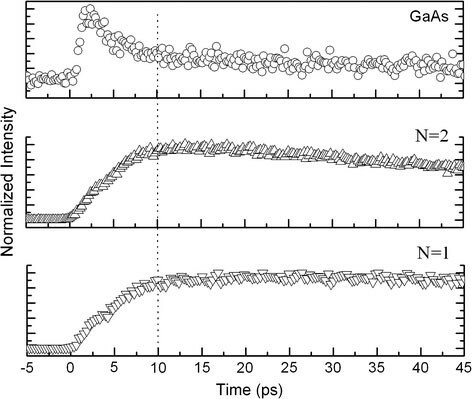 The sample under investigation was grown by Molecular Beam Epitaxy on ¼ 2′′ In-free mounted (1 0 0) GaAs substrate and it consists of three QD layers separated by 40 nm-thick GaAs barriers. The AFM analysis, on an uncapped reference sample, reveals a QD density of about 3 × 1010 dots/cm2with average dot diameter of 40 nm and height of 5 nm. Figure 1 shows the room temperature photoluminescence as a function of the excitation density. In order to reach the ground state saturation a Limited Area Photoluminescence was performed on the sample. To reduce the probed area we coated a quartz wafer with a photolithographically defined Ti/Au layer containing an array of widely spaced holes of 200 μm which could be placed metal layer down on sample. Than we pump through one hole and we detect only emission from the probed area. The emission coming from carriers diffused away from the probed area will not be detected. For optical pumping we use a mode-locked Ti:Sapphire laser (80 fs pulses at 80 MHz repetition rate) tuned at 780 nm. The PL intensity dependence as a function of the excitation density for both transitions (N = 1 andN = 2) is quantified in the right plot of Fig. 1. These results clearly indicate that first-excited-state emission is observed even at excitation densities well below the level required for state filling in the ground state. For excitation levels below that required for ground-state filling, the ground-state emission, as expected, increases linearly with excitation and it finally saturates. At higher power it starts to decreases and a red-shift (left plot of Fig. 1) of the whole spectrum occurs due to the sample heating. This suggests a random capture of exciton in such nanostructures in spite of a stepwise relaxation with an excited-state emission occurring after the ground state saturation. To confirm our hypothesis time resolved measurements were performed as a function of the temperature and the detection energy. Time resolved photoluminescence (TRPL) up-conversion measurements were performed by using a mode-locked Ti:Sapphire as excitation source. The emission of the QDs was upconverted with a time-delayed portion of the excitation beam in a 2 mm thick b–barium–borate (BBO) crystal. The upconverted PL light was detected by a monochromator and a cooled GaAs photomultiplier in single-photon counting mode. Figure 2 shows the normalized time resolved photoluminescence spectra of the ground level (N = 1) as a function of temperature (left plot) for excitation power density of about 860 W/cm2. The right plot of Fig. 2 displays the temperature dependence of the decay time obtained by fitting the PL decay profile to a single exponential function. With increasing temperature from 80 K to 170 K, a linear increase of the radiative decay time occurs up to 500 ps. This behavior can be attributed to carrier thermalization among different QDs. In this temperature range, the carriers can escape from the smaller QDs and they can be recaptured from the bigger one [8–10]. In fact, since the bigger QDs have lower transition rates than the smaller ones, the carrier transfer from the latter to the former causes a slight increase of the radiative decay time [11, 12]. For T > 200 K, a strong reduction of the decay time occurs. By fitting the experimental data to an Arrhenius plot, we found an activation energy of about 300 meV, which is consistent with the energy difference between the QD ground-state and the InGaAs quantum well lowest state. This suggests that at high temperature the thermal escape becomes the main non-radiative process. Figure 3 shows a comparison among the time evolutions of the different emission peaks observed in the cw-PL spectrum on a time scale of 45 ps. It is clearly visible that the rise times of the QD states are nearly identical. We have found a rise time of 5.9 ± 0.2 ps, 6.3 ± 0.2 ps for the ground state and the first excited state, respectively. So, we don’t observe any sequential PL intensity building up starting from the top energy state . The carriers, which are photo-generated in GaAs barrier, can cool down directly and simultaneously to any lower energy state. In fact the sum of the rise time (∼2 ps) and the decay time (∼4 ps) for the GaAs emission confirms the carriers dynamics just described. Therefore our observation indicates that the intra-dot relaxation is slower than the direct carrier capture for high power density excitation. Such a fast relaxation probably occurs through a finite continuum of density of states, which has already been observed by Toda et al. . Alternatively, it could be related to the existence of intrinsic crossed transitions between the bound QD states and delocalized states as proposed by Vasanelli et al. . Preliminary results from in-plane absorption measurements (not shown here) confirm the existence of a continuum of states in the spectral range of the QD transition energies in our samples. In conclusion, we have measured the rise and decay dynamics of the ground and first excited state of InAs QDs capped with an InGaAs quantum well. We have found that the higher energy states of the QDs don’t act as intermediate stages in the carrier relaxation, while the carriers can cool down to any lower energy states following a relaxation through a continuum background. The fast capture, mediated by a continuum of hybrid 0D–2D states, shows the potential for high modulation speeds in 1.3 μm QD devices . The authors gratefully acknowledge the expert technical help of P. Cazzato and D. Mangiullo.